One of my first experiences in witnessing the amazing dynamic that is possible in the interaction between horses and humans occurred at a maximum-security prison in Florence, Colorado. It was here that I was introduced to the Wild Horse Inmate Program or WHIP. 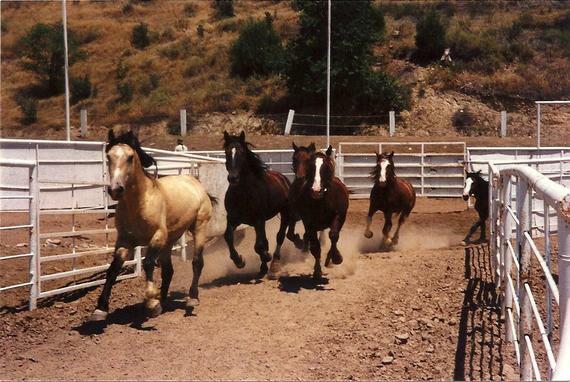 The Wild Horse Inmate Program was originally set up by the U.S. Bureau of Land Management (BLM) to assist in managing the country's thousands of free-roaming wild horses. To safely gentle thousands of horses and prepare them for adoption by the American public would require many experienced horsemen. Unfortunately, this was prohibitively expensive so the BLM came up with what they believed to be an ingenious solution. The concept was simple: if prison inmates could be used as cheap labor and taught to manufacture license plates, why not teach them how to gentle wild horses? In 1995 I went to this prison to study the wild mustang and learn what effect, if any, working with horses might have in the practical rehabilitation of hardened inner-city criminals. What I saw was a miraculous transformation I don't think anyone could have imagined. I certainly hadn't. The inmates who participated in WHIP had committed every crime imaginable, some frightening or violent. They arrived at prison with a lot of swagger. Most were from gangs. In their world they saw themselves as tough guys, dangerous, bad. But the first time a wild mustang came at them, their rock-hard attitudes crumbled. On the streets the only way they knew how to relate to almost anyone was with anger, mistrust, and deadly force, but now it was instantly apparent that their way wouldn't work with these horses. During my visit I spoke with many inmates. One of the most profound conversations I had was with a young man named Morris. Morris told me that he saw in these horses something that he knew was also inside him, something he could never admit to himself or anyone else. Morris had been living his whole life in fear. If these powerful, tough wild animals could be afraid, he said, then maybe he could say he had been afraid, too. It was amazing; Morris had had an epiphany. And just as with Morris, something was happening to all the men in the WHIP program. The inmates saw that the mustang's violent behavior was caused by fear. The horses were just trying to survive. They acted mean and aggressive, but in reality they were scared to death, just like the men. For the first time in the lives of these men, they were shown the undeniable truth about who they were. They had learned and believed that being tough and vicious was their only hope of survival. But now -- just like these beautiful, wild, violent, and unpredictable animals -- the men could see that their motive had also been fear. And maybe, just like the horses, they too could change. The inmates were trying to gentle the horses, but in truth the horses were gentling the inmates. The process of gentling wild horses to fit into human society was simultaneously gentling "wild" humans to fit back into the same society. As I left and drove away from the prison, I realized I had not only watched the use of cheap prison labor save a great American icon, the wild mustang; I had witnessed the unintended healing of lost souls.